The Telugu blockbuster, ‘Temper’ starring Jr NTR and Kajal Aggarwal as the lead pair which was directed by Puri Jagannadh, is now all set to be remade in Tamil industry under the direction of Lakshman of ‘Bogan’ film fame will be wielding the megaphone for the Tamil remake. 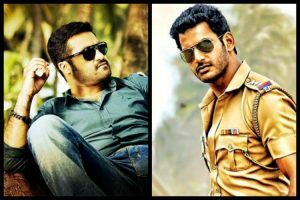 Actor Vishal Krishna has been signed up to reprise the role played by Jr NTR. The female lead of the film is not yet declared. Vishal has just signed for the film. So, the whole cast and crew along with the technicians are yet to be decided. The official announcement will be done as soon as it is finalized. As per the filmmakers, all the characters would remain the same but the plot has been transformed to suit the taste of the Tamil audiences. Vishal is currently busy in shooting for his current film titled ‘Sandakozhi 2’, which is at present in its final stage in Madurai. The movie is directed by N Lingusamy. After completing ‘Sandakozhi 2’, director Lakshman will begin the Tamil remake of ‘Temper’ with Vishal playing the lead role. It is rumored that the lead actress may not be changed, Kajal Agarwal herself may be the lead actress even in the Tamil film starring opposite to Vishal. The Telugu film was released in the year 2015, ‘Temper’ grossed over all Rs. 74 crores worldwide with a 100 day run at the box office collections. The film is based on the story of a bad cop who turns good for the sake of his girlfriend and fights against the law in a court for a good cause and will. The film may move on to the sets in the late June or in the month of July. The declaration of the cast will be done very soon. As per the reports, it is stated that the film may hit the screens in the late December or the early next year 2018.